Sometimes it does not matter how much you like a particular kind of software when the only way to fix a technical issue is to uninstall it. The Native Instruments application for macOS is a complex type of software. So, depending on how many products by Native Instruments you have, you may have to repeat or skip some of the uninstallation steps. In this post, we are going to share two methods of Native Instruments uninstallation on a Mac. How to uninstall Native Instruments manually. How to uninstall Native instruments automatically. The first step is very easy and it is likely that you have done it more than once before. Open the Applications folder → find the Native Instruments folder → select the Native Instruments folder and Native Access.app → remove them to Trash. ~/Library/Preferences/com.native-instruments/*product name*.plist and hit Go. Select the file and remove it. ~/Library/Application Support/Native Instruments/*product name* and hit Go. Choose the folder and delete it. 3. Empty the Trash bin to complete the uninstallation of the Native Instruments application and its service files. Select the Native Instruments folder. All applications will be selected automatically. You can also untick any item you want to leave in any case. Click to remove them. Review the items you are going to delete and click the Remove button. Empty the Trash bin to complete the application’s removal. Some applications have service files, which can be scattered inside different folders. Because of this, they are very hard to find without the help of the application’s technical support service or recommendations within specific online forums. 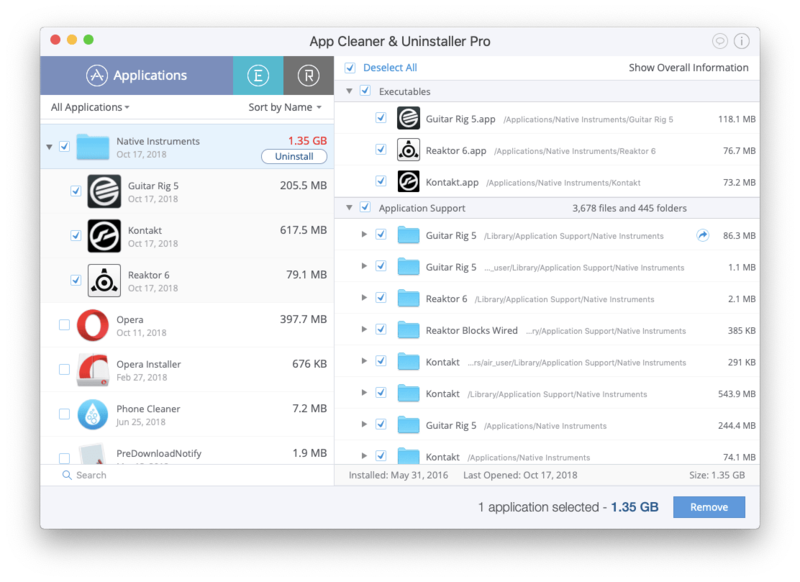 In case, you do not want to uninstall the app manually, or you do not have time to wait for a competent answer, you can try App Cleaner & Uninstaller. It was designed for macOS and is compatible with Mac OS X 10.10 and later. 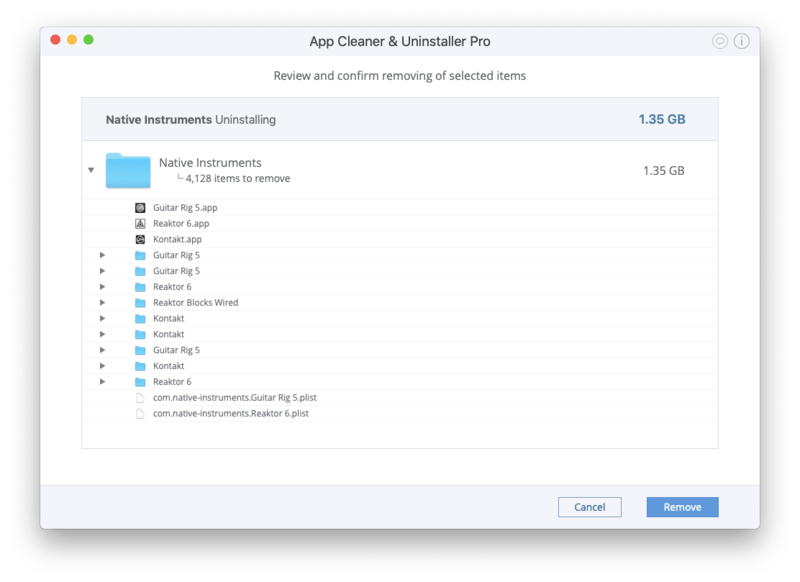 In this way, you can be sure that App Cleaner & Uninstaller will uninstall apps on a Mac both correctly and completely.